Life in Darbnik wasn’t easy for the Margaryan family. The village of Darbnik, Ararat province, has become home to 26 families who escaped war in Iraq in recent years. The United Nations mission in Armenia has renovated the building of Darbnik’s former agricultural college, and prepared 46 apartments for the refugees. In April, last year, the Margaryan family settled in Darbnik, after having originally fled to Armenia in 2004. The eldest member of the family of 9, Genevel Margaryan, 62, recalls that it became impossible to live in Iraq, where the family had lived in Baghdad since early last century. “I could go to a market and never come back,” Margaryan says. The family was worried about kidnapping (widely spread in Iraq), and made a decision to quit everything and to seek asylum in the historical homeland. “Now when we get home, and I show you our photos (of their Iraq home), you will say, “Oh my God, how do you live here,”” Margaryan says walking along the muddy streets of Darbnik to home. Darbnik (some eight kilometers southwest of Yerevan) is a village of only 1,130 residents and more than 90 percent are refugees. In Soviet times the village was populated by ethnic Azerbaijanis, who left Armenia during ethnic tensions in the late 80s leaving their village to Armenians who fled Azerbaijan. Now the village has 315 households, of which 26 belong to Armenian refugees from Iraq. Margaryan came to Armenia with her husband, two sons, daughters-in-law, daughters, and two grandchildren. The family lost the head (Margaryan’s husband) in Armenia, and two members were added (the younger son’s two daughters). Brothers Aram, 37, and Azat, 30, are married to two Assyrian sisters – Nadia and Asil. When coming to Armenia, they used to rent an apartment before moving to Darbnik. “Papa (her husband) could not stand it anymore, soon after moving here (in 20 days), he died. He said, ‘Oh my God, what a place is this?! There is not even asphalt here’,” Margaryan tries to explain why her husband died. He could not put up with the fact that they had lost their house in Baghdad. They have a satellite in their house in Darbnik, tuned to an Arabic music channel. 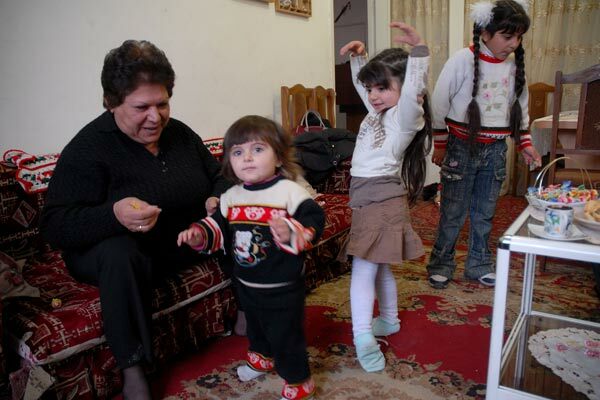 Genevel asks her grandchildren to dance, demonstrating the Arabic dances taught by Asil. Currently, the Margaryan brothers have a car renovating workshop in Yerevan. “Life is very expensive here. We have paid no money for water, electricity and gas in Baghdad, everything was free of charge,” says Margaryan, who cannot put up with Armenia’s winter, too. “Besides, the state was giving all families some goods (rice, flour, and sugar) every month free of charge,” says Asil, 24, who learned Armenian after getting married. However, some Russian words are already noticed in her speech (something very typical to Armenians living in Armenia). According to Gohar Galstyan, Chief Coordinator of ‘Cultural Adaptation through Education’ program of Save the Children NGO (the NGO implemented a number of programs on the adaptation of Iraqi-Armenians and the improvement of their life standards in Armenia), besides the asphalt, the country transportation creates many difficulties for Iraqi-Armenians (the bus passes through several villages, and it takes about an hour to get to Yerevan). Rubbish collecting is not implemented here at all (peasants are simply throwing their garbage on the road taking to the village). Galstyan says moving to Armenia comes with social problems for Iraqi-Armenians, who typically had more comfortable lives in pre-war Iraq. “They also have some problems connected with the language, because they do not speak the (Armenian) language well enough to get a normal job. Besides, only few of them have a higher education, most of them (Iraqi-Armenians) are jewelers and auto mechanics,” Galstyan says. She adds that majority of Iraqi-Armenians are not interested in getting an Armenian citizenship. “First, in case of getting an Armenian citizenship, they will not enjoy any privileges (those which they have being refugees) any more. Besides, many of them have not made a final decision whether to stay in Armenia or leave for another country,” Galstyan says.